A: In order to empower autonomous driving hundreds of thousands hours of sensor data are required. Individual data acquisition without merging possibility is never able to gain the appropiate amount of data needed to secure all driving scenarios. This can only be achieved by crowdsourcing the data by incentivizing road users with IOTA Tokens. A decentralized market place ensures the complete data availability. Q: What expertise and roles did you have on your team? Q: Which technologies and tools did you use in your project? 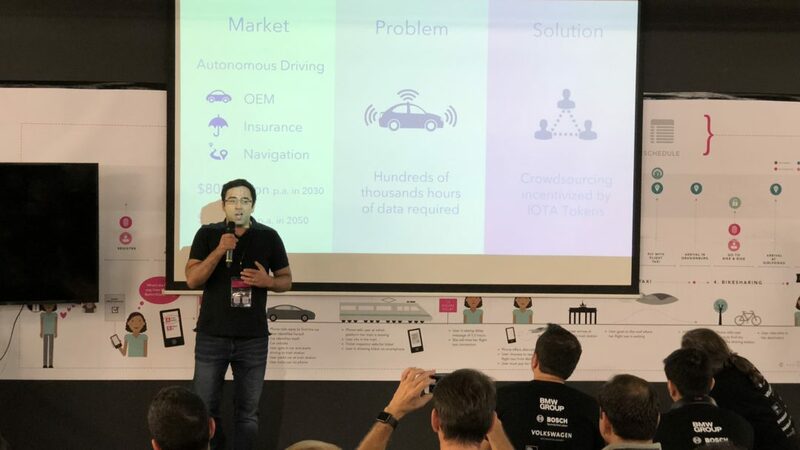 After we finished the Blockchained Mobility Hackathon with the 3rd place our team quickly set up communication channels to stay connected. Although our team has just found itself on the Hackathon we have a very strong attitude our project will successful be enhanced and implemented now. Because of the perfect mix between software and business developers and the seamless collaboration inside the team we have a strong starting point now. By attending at the DAHO.AM conference right after the Hackathon we received positive feedback from several attendees and company representative to have found a well-fitted business case here. The strong interest in “Pac-Man on Wheels” strengthened us once more to proceed with the project. We already spoke to interested companies and investors at the DAHO.AM and figured out some approaches how to get going. We are still in negotiations if the project will be kicked off as a start-up or, which is actually more likely, integrated into a project of an existing company. Since nothing is settled yet, we appreciate and want to encourage any interested party to get in touch with us to discuss common realization possibilities.